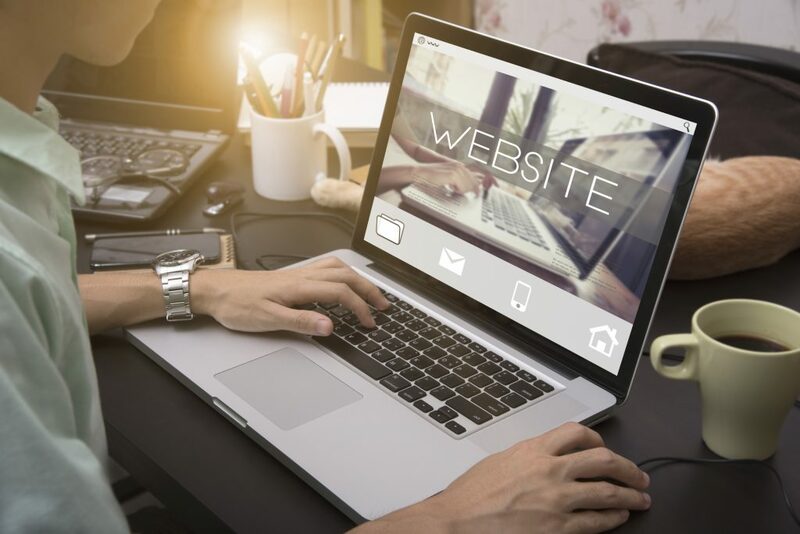 Innovative Web Design Trends to Watch Out for in 2019 | Host.ie - Linux Hosting packages for all your Irish web hosting needs. By the end of 2018, there were a whopping 1.94 billion websites on the internet. Clearly, we’ve come a long way over the last 27 years! It’s impressive, no doubt. But frankly, with so many sites it’s easy for web design to get a little, well, stale. It’s easy to rest on outdated design laurels. As the number of sites increases, it’s crucial that designers stay on top of novel designs trends. It’s the only way to stay ahead of the game and stand out from the crowd. With this in mind, what kinds of innovative web design developments should you look out for in 2019? We wanted to help. Keep reading to find out 8 of the most innovative design trends for the year ahead. A new year calls for new web design trends! Here are 8 to look out for as we get started in 2019. Glitch art was once an accidental outcome of awful dial-up speeds. But this is one retro accident we’re glad happened. The startling, stilted, striking, distorted images are usually weirdly captivating. It’s going to be big in 2019. After all, the glitch is an antidote to the quick, slick, perfect pro sites we’ve become accustomed to. Glitches hold the eye, grab your attention, and pull you into the design. The rise of video content is nothing new. For example, every day, 500 million hours of videos are watched on YouTube, and 500 million people watch video on Facebook. The staggering popularity of video has led Google to rank videos above written form content. Web designers will do well to heed this development in 2019. Video content should be incorporated into pages to facilitate higher rankings. It’s hard to overstate the importance of colour in web design. It (literally…) sets the tone. After all, colours are often attached to emotion. We see particular colours and shades and feel a reaction. For instance, red is a powerful symbol of anger. Blue is cooler and more relaxed. Brands pay close attention to the colours they use. They know it’ll have an impact on how they’re perceived. The same will be true in 2019. However, we might see increasing use of black-and-white (BAW) palettes too. The absence of colour offers a simplicity that’s hard to ignore. There’s striking hypnotism to BAW design. Where colour can be a distraction from detail, BAW opens your eyes in novel ways. Use it this year to accentuate your design and make a statement. In 2019, go 3D instead. Use 3D animations and illustrations to present novel, captivating graphics. People adapt quickly to trends. And we’re now saturated by sites and adverts that rely on 2D imagery. The effect is no longer the same. Mix it up this year by utilizing 3D to grab peoples’ attention. You could create a video with 3D animations. Your site banner could incorporate 3D graphic figures. The development of artificial intelligence (AI) is facilitating the rise of chatbots. 2018 was a big year for chatbots. 2019 is set to be bigger. They’re now more intelligent, and therefore useful to users. These bots promote engagement, increase conversions, and can support the personalization of content suggestions. Your web designs should consider their usage this year. Minimalism will remain an effective design tool in 2019. Championed by giant brands like Apple, this trend took off over the last few years. The simplicity of form, font, colour and content, all help reduce distraction. A lack of distraction means less thinking is required by users. Minimalism facilitates ease of use by its nature. After all, there isn’t a lot there! Navigation is simple. This creates a stress-free (and therefore more enjoyable) site experience. Brutalism is almost the antithesis of minimalism. It’s almost a reaction to it. And it is likely to feature more and more in 2019 web design. Brutalism is solid, anarchic, uncomfortable, nonsensical and raw. Brutalism is the punk rocker of design. The two disparate design trends work off each other. They’re two extremes: the simple, sleek, perfection of minimalism is in sharp contrast to the rugged brashness of brutalism. It’s sure to find growing popularity among anyone tired of the light, optimistic undertones of modern-day design. Web design must be optimized for all devices. 50% of web page views around the world were on mobile devices at the start of 2017. That figure’s sure to have increased since then. Your designs must be mobile-ready if they’re to be successful in 2019. Similarly, most people interact with their mobiles using a single thumb. Held in either the left or right hand, there’s often only one thumb available for use. Occasionally, both thumbs will be involved! Nonetheless, this has major implications on web design. The layout must be carefully considered for ease of use. Navigation, buttons, forms and every other feature should be taken into account. There you have it: 8 innovative web design trends for 2019. The internet is now full of websites. Designers must stay ahead of the game for their sites to stand out from the crowd. It’s important to be prepared for the newest trends. Hopefully, the information here will help you do so this year! Ensure success by incorporating glitch art, video content, black and white palettes, 3D imagery, chatbots, minimalism, brutalism and mobile optimization into your design work. Each trend will feature strongly in 2019, and enable you to compete with the best sites on the web. Did you enjoy this post? Want more of the same? Click here for more essential website related tips. And be sure to contact us to find out how we can support you with your web hosting.